A Celebration Service was held for Ronald Mayfield on January 26, 2019, at Lake Leon Baptist Church in Eastland, Texas. Ron was born February 22, 1950 in the polio unit of Hendricks Hospital in Abilene, to JT and Mary Ann Mayfield. He went to his heavenly home on January 18, 2019 in his home in Eastland County after a short battle with cancer. Ron was raised on a farm near Lazbuddie, learning to work hard with his dad farming and raising show pigs by the age of 9. Winning many awards, his most prized was back to back Grand Champion Pigs at the State Fair of Texas. Ron attended Texas Tech University and graduated with a degree in Ag Education. Always faithful attending church, he began teaching Sunday School in the 1970s and continued until December 2018. He became a deacon in 1991 and faithfully served in Lamesa, Big Lake, Fort Stockton, Acton, and Eastland. He began his education career as an Ag Teacher and FFA leader. He taught 13 years in: Lorraine, Amhurst and Lamesa, training teams for Leadership competitions, winning many District and State awards. He served Lamesa ISD for 13 years as Assistant Principal, Principal, and Assistant Superintendent. For another 13 years he served as Superintendent in Reagan County (Big Lake), Fort Stockton and Granbury before retiring in 2012 and moving to Eastland County. Not willing to leave school business behind, he worked part time selling school furniture for Lone Star Furnishings until his passing. Ron is survived by his wife of 46 years, Suzan Mayfield of Eastland; son, Jason Mayfield and wife, Fran, of Spring; daughter, Melissa Hamor and husband, Jason, of Fort Worth; six grandchildren: Addy, Cori and Kara Mayfield of Spring, and Elizabeth, Jeremiah and Rebekah Hamor of Fort Worth; mother, Mary Ann Mayfield of Bedford, and sister, Marsella Jennings and husband, Joe Brian, of Hurst, one niece, Mia O’Neal and husband, Mike, of Colleyville. He also leaves many cousins, in-laws, and friends. Ron was proceeded in death by his father, JT Mayfield and one grandson, Toby Hamor. 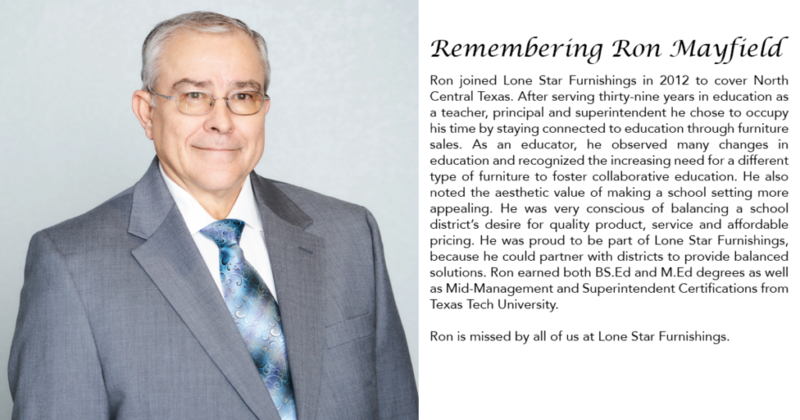 In Lieu of flowers the family is requesting donations be made in Ron’s memory to the Building/Technology Fund of Lake Leon Baptist Church; P.O. Box 1160; Eastland, Texas 76448, or your local Education Fund.